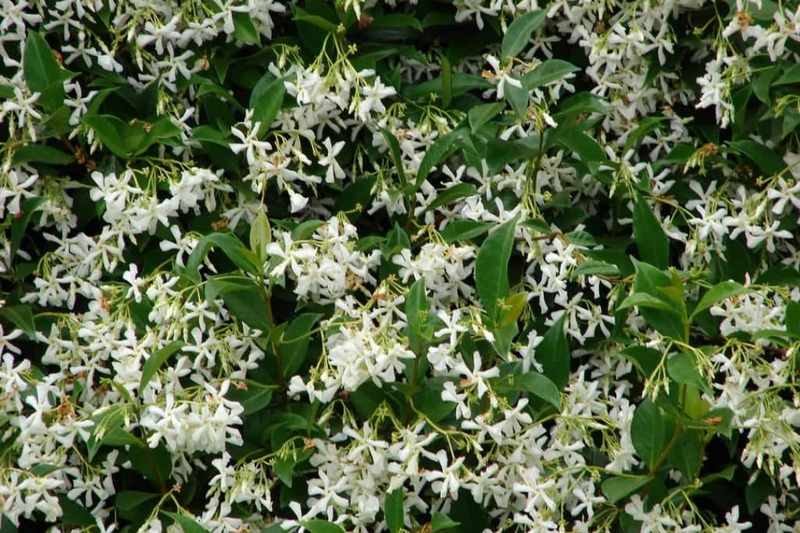 Star Jasmine (Trachelospermum jasminoides): growing, planting, caring. Slightly frost-sensitive plant with flowers resembling that of the jasmine. Trachelospermum jasminoides is commonly grown as an ornamental plant and houseplant. In gardens, public landscapes, and parks it is used as a climbing vine, a groundcover, and a fragrant potted plant on terraces and patios. It will flower in full sun, partial shade, or total shade, and requires well-drained soil, moderate water, moderate fertilizer, and a climbing structure. 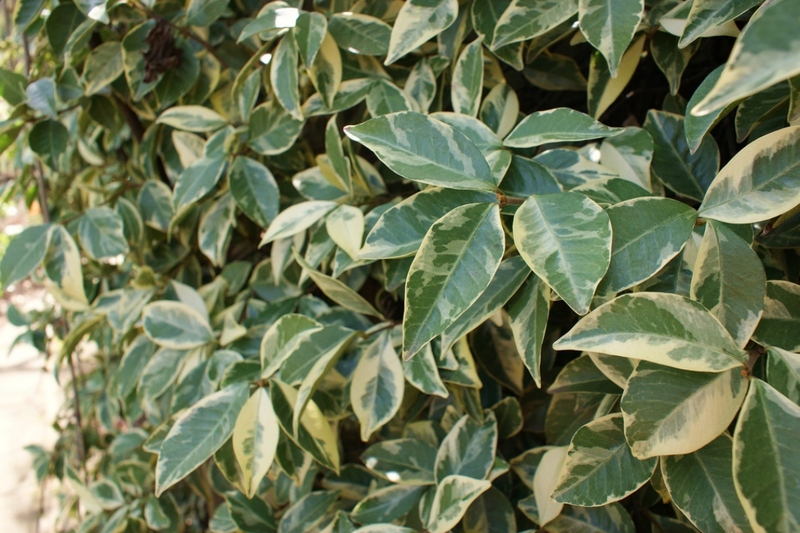 Liana with evergreen foliage, opposite leaves, waxy, deep green. The flowers are in corolla with petales covering each over on their right, white, of a few centimeters. Plant in autumn, in winter out of frost or early spring, in full sun, fertile soil, well drained, cool, along a wall, sheltered from cold winds, in the sun. Dig a 40 cm deep hole and plant without burying the stems. Re-fill the hole with loam and woody compost, tamping regularly around the roots. Water copiously. Provide a solid stake around which your climber can fix. Water twice a week in the first month if you have planted late in the season - and in case of drought. In early spring, prune to keep the plant in its intended volume. If you do not have much space requirements, do not cut in length. After a few years, start cutting the stems that are too entangled from the base. In spring, mulch your star jasmine with dead leaves or crushed wood. 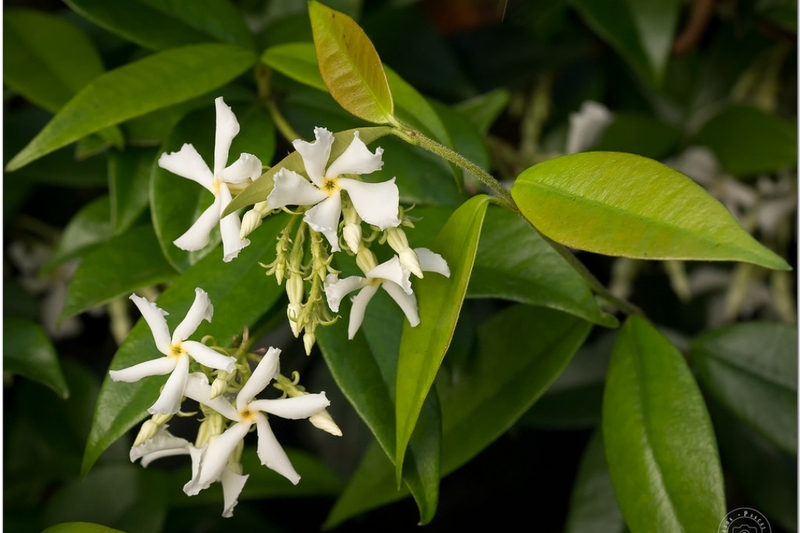 Fertilize in November by placing at the foot of your star jasmine some compost.